Even though it's a few years old now, the quality you can get out of the Optoma UHD60 for just $1,999 feels little short of miraculous. When the Optoma UHD60 projector was launched a few short years ago, we found it pretty much instantly turned the projector market on its head. It was one of the first 4K projectors that used DLP technology and still stands the test of time despite fierce competition from its rivals. The UHD60 is an attractive machine considering it’s delivering a grade of DLP performance that was considered new at the time of launching for a startlingly aggressive price. It’s clad in an appealing gloss white finish and sports just enough gentle curves and angles to carry off its unusually wide (490mm) bodywork. Cunning use of horizontal ribbing to either side of the centrally mounted lens even makes a design virtue out of the projector’s inevitable cooling vents. The whole front half of the top panel flips up to reveal a lamp access hatch, the zoom control lever around the lens, and a simple vertical image shifting wheel. This wheel doesn’t let you move the image quite as far as we’d have liked, but it should be enough to enable most people to get their image in the right place without having to resort to keystone correction to keep the image’s edges perpendicular. The only design issue is that the lift-up top panel feels a bit flimsy, and leaves the top edge looking slightly uneven even when it’s shut. The UHD60’s connections include highlights of two HDMIs (one of which, HDMI2, can handle 4K, HDR and MHL 2.1), a VGA PC port, a powered USB port to support HDMI dongles such as the Google Chromecast, a 12V trigger out, plus RS-232 and RJ45 ports to help integrate it into a home control system. The presence of a few audio jacks, meanwhile, alerts you to the fact that unlike most ‘serious’ AV projectors, the UHD60 sports a built in sound system. Design TL;DR: Despite a flimsy top panel and unusually wide stance, the UHD60’s glossy white finish and rounded corners make it pretty easy on the eye. The UHD60’s key feature triumvirate are its HDR playback, its native 4K resolution, and the fact that it offers these features for just $1,999/£2,400. It backs its HDR claims up with some strikingly high specification numbers, too - especially a claimed dynamic contrast ratio of 1,000,000:1 and a high maximum brightness of 3000 ANSI Lumens. Obviously these figures need to be taken with a healthy pinch of salt given that they’re measured in conditions you would never find when watching real world content. But they nonetheless imply that Optoma is taking the UHD60’s HDR duties unexpectedly seriously for $2,000. The HDR support is limited to the industry HDR10 standard. While it might have been nice to also find support for the HLG broadcast HDR format, HDR10 is all I’d really expected to find. In fact, any HDR support at all at this price is a welcome bonus. The UHD60’s native 4K support on a single-chip DLP projector feels almost like arcane wizardry. It's essentially delivered through a combination of the fast switching speed of DLP’s digital mirror device (it switches so fast that each mirror can apparently create multiple pixels for each 4K image frame) and advanced processing. However, unlike ‘pseudo’ 4K solutions from rivals such as JVC and Epson, the UHD60’s 4K solution has been given the ‘real 4K’ seal of approval by the independent Consumer Technology Association. More importantly, given that seeing is always believing with this sort of stuff, the resolution really does seem to be right up there on the screen with the UHD60, as we’ll discover later. In what we think is a first for a projector, the UHD60’s picture options include an SDR to HDR conversion system. Plus it carries all the colour, gamma and white balance adjustment tools required for a professional calibration by an Imaging Science Foundation engineer. The projector provides a lengthy and mostly well-conceived set of picture presets for people who want a quicker image set up solution, with the three highlight options being the Cinema one that works best for standard dynamic range films; the HDR one that works best for - you guessed it - HDR, and a Game preset that places an emphasis on minimising input lag (the time the projector takes to produce its images) and boosting contrast and detail. 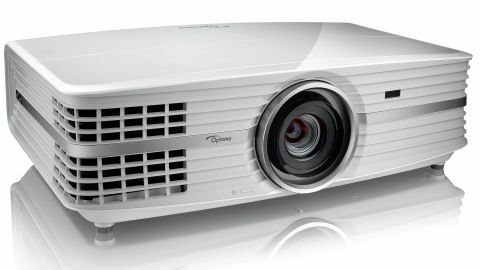 Features TL;DR: The UHD60 is well featured and specified for such an affordable projector.